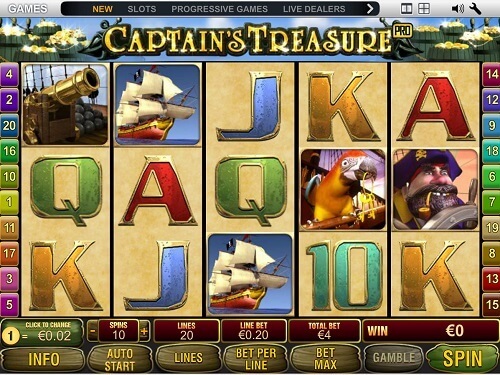 Playtech is the software developer responsible for creating the Captain’s Treasure video slot. This is a casino game that has become very famous in South Africa as in the rest of the World. The graphics on this slot are very impressive which makes this game a benchmark for casino game visuals. Although the game is powered by the best audio-visuals it is packed with real money rewards. Play NowThis game is pirate themed just like the name of the slot hints. It constitutes of 9 pay lines and like most casino slots it has got 5 reels. The Captain icon is the wild symbol in this video slot while the Treasure Chest symbol is the game’s scatter. Other symbols that you may find in this slot are the wheel, anchor, cards with numbers among other symbols. Firstly players should place their bets, this is, after all, is what real money gambling is all about. The coin denominations can be altered by adding or subtracting accordingly with what you have as your bankroll. Proceed and click the spin button to activate the bet. There is also the Bet Max feature which makes sure that the reels always spins at the maximum bet. AutoPlay allows you to play for a couple of times without any external interruption. This game has got a lotto type game which makes players choose 5 out of 49 numbers. Winning numbers will be randomly chosen. Having the five numbers you have chosen match the winning numbers will earn you a jackpot. The in-game jackpot boosts your bankroll with 5,000 coins. It is triggered when 5 Sword symbols appear on the reels. Another prize in the game is the treasure map jackpot. This is activated if 5 treasure map symbols appear on the reels. It is offering 2,500 coins to the players. The wheel and the anchor will earn you 1,000 coins each. Landing three scatters on the reels will earn you 10 free spins. This slot is very intriguing with its jackpots which are diverse. The chances of winning on this slot are larger making players enjoy this game more. Graphics which are classic make this game adorable. Players should try out this video slot. Find more slot games at our top casinos here.